Karst areas are usually ecologically fragile complex terrains, where the topography considerably affects vegetation coverage. Although the relationship between vegetation and topography has been studied extensively, this relationship is not well understood in the karst areas. In this study, vegetation coverage was estimated in a typical karst basin for the years 1995, 2005, and 2016, using remote sensing data and the dimidiate pixel model. The spatial–temporal variation in vegetation coverage and its response to topography were quantitatively analyzed. Overall, the results showed that the vegetation coverage in this region increased from 1995 to 2016. The area under extremely high vegetation coverage increased from 26.6 to 56.0%, while vegetation coverage levels decreased in all other areas. Moreover, vegetation coverage varied with topography. It first increased with elevation but then continuously decreased, and the decrease in vegetation coverage was the most obvious on the steeper slopes. Vegetation coverage was higher with sunny aspects than with shady ones. The effects of ecological restoration were apparent in the Lianjiang River Basin from 1995 to 2016, especially on the sunny aspects at elevations between 650 and 1100 m and with a slope steepness < 30°. The results will help us identify the influencing factors and build models to predict soil loss from forests with little understory vegetation in the red soil region of China. They also improve our understanding of the effect of topography on vegetation coverage in the karst areas. Accordingly, appropriate vegetation restoration measures can be taken for varied terrains. 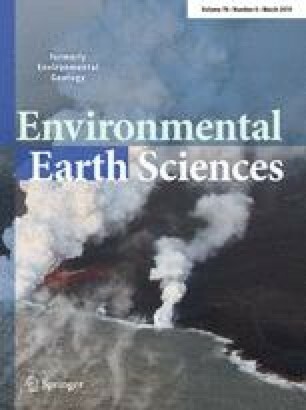 This article is a part of Topical Collection in Environmental Earth Sciences on Characterization, Modeling, and Remediation of Karst in a Changing Environment, guest edited by Zexuan Xu, Nicolas Massei, Ingrid Padilla, Andrew Hartmann, and Bill Hu. This work was supported by the National Science Foundation of China (Nos. 41761003 and 41601471); the Project for National Top Discipline Construction of Guizhou Province: Geography in Guizhou Normal University (No. 85-01 2017 Qianjiao Keyan Fa); the Science and Technology Support Program of Guizhou Province (No. Qiankehe Zhicheng 2855); the Basic Research Program of Guizhou Province (No. Qiankehe Jichu 1131); the National Key Research and Development Program of China (No. 2016YFC0502300); the Project of Social Development of Guizhou Province, (No. 3127): Evaluation on Comprehensive Effect of Rocky Desertification Control.